Cyclists rejoice! Just because you couldn’t bring your bike as a carry-on item this trip doesn’t mean you should give up your favorite hobby when you’re on vacation. There are places across Alaska to rent bicycles and routes for every endurance level – from fat-tire biking to leisurely cycles through the city trail system. Check out this guide for the best places to rent bikes and the best places to take them. A quick Google search will give you an abundance of options to choose from as far as bike rentals go, but how do you know which is best for you? Here are some to start you off. Fairbikes in Fairbanks – see Fairbanks by the seat of your pants with this bike-share system and app. Find your bike, rent, ride and return. It’s the perfect way to explore the city in the summer. 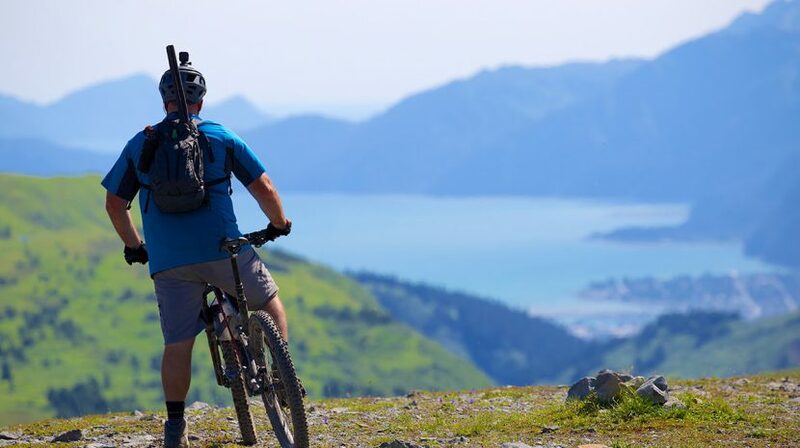 Cooper Landing Bike Rental in Cooper Landing – minutes away from our Kenai Princess Wilderness Lodge, this rental service will give you a trail map or a guided tour to some of the most amazing destinations around. Denali Outdoor Center at Denali National Park – There are only a few ways to see Denali; you can walk, take a bus or hop on a bike! Denali Outdoor Center lets you rent a bike and take off on your own or participate in a tour. You can even make it a combo trip. Bus in and bike out, it’s the best of both worlds! Once you’ve successfully acquired your bike, it’s time to hit the trails (or make some of your own). There are seemingly endless trails in Alaska, from gentle, paved pathways to expert-level mountain climbs (and descents). In Fairbanks, a favorite trail follows the Chena River, and another, a good half-day trip, is the Farmer’s Loop. It’s 16 miles total and completely worth it for the views of the city and the Alaska Range more than 100 miles to the south. Get some elevation at the Birch Hill Recreation Area and the University of Alaska Fairbanks trails. Guided excursions for a variety of skill levels in Cooper Landing will take you through Johnson Pass, to Crescent Lake and on the Old Sterling Trail. We also recommend checking out Devil’s Creek and the trail systems at the Russian River Campground. If you time it right you can even watch the salmon run climb the fish ladder. Don’t forget your bear spray! Wherever you choose to ride, remember to play safe, wear your helmet, watch for and respect wildlife and most importantly have fun!